Do you like hiking? 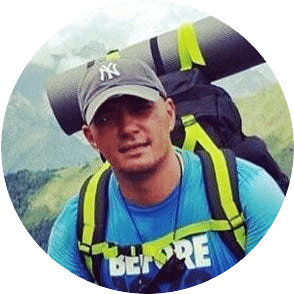 Since you are reading this article you will probably say yes, but what about the moment when you are getting ready to take off your heavy, hard, hiking boots and hit the sack for that well deserved good night’s rest? Do your feet feel cold then? Has this thought occurred to you “I would love to have my feet warm as they are while in the boots, but I can’t sleep in them”? Have you heard of Men’s Down Booties? They are the solution for your cold feet! High-quality down booties combine best performing natural materials with high-end artificial fabrics providing you with the highest possible level of the foot insulation. 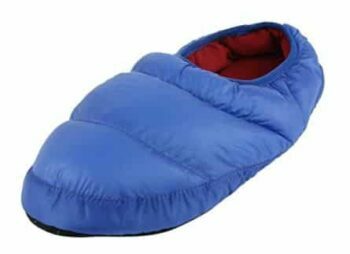 Some down slippers are rated as rugged and outdoors, and can accompany you very well in various winter outdoor activities from camping in tents to skiing. You can also find some very comfy and warm all-synthetic insulation slippers and slipper booties. Insulation slippers are a relatively modern thing, not only warm, but also much lighter in weight. That is thanks to either having no rubber sole or combining modern light rubber sole with ultra light materials on the upper. Some of the best insulation slippers feel as light as socks, though their insulation properties are more comparable with those found in boots. In this article, we will discuss booties, the features you should be aware of and show you some reviews so you can choose the best pair for you. To find a great insulation slipper which will change your indoor life and comfort you should learn some basics about the technology and design. Materials used in modern slippers are predominantly synthetic fabrics on the upper and heel (whenever applicable) as well as reinforcements on the sole. Sole also can feature no-slip outsole elements and cushion insoles. Various insulation materials can be found – from artificial cush and foams to wool or down, which can be the bird or artificial down. There is no great difference regarding insulation properties. Differences in slipper insulation are not of a major significance, most of these insulation materials will do the job properly, so you should rather look into weight and comfort properties – in particular the feeling of your feet after prolonged wearing, which is the paramount determinant of any shoe or slipper quality. To improve your feeling and support breathing of your skin even in day-long wearing, some makers will use cotton and similar natural fabrics to make you feel fresh and clean after hours of having your slippers on. For the outer surface, manufacturers prefer synthetic fabrics which don’t add much to the slipper weight, provide water resistance to some extent, improve inner comfort and make maintenance easy. In most cases polyester finishing is used, sometimes nylon or PET. These man-made fabrics will protect both your feet and the insulation layer beneath. Outsole materials are equally important. The main idea is to prevent slipping, for which various rubbers and other high friction materials are used. 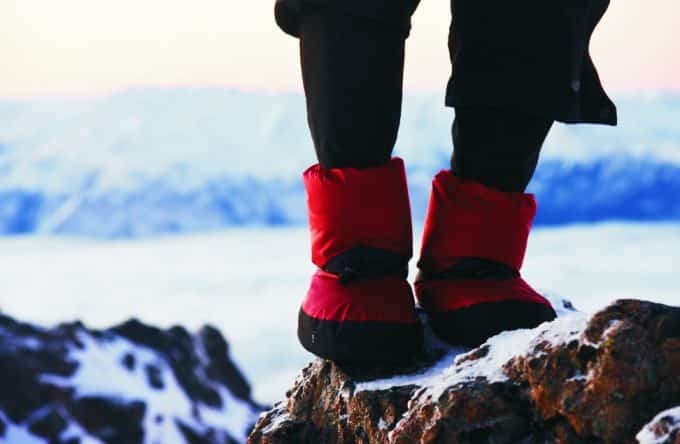 It is very important if you are looking for active wear slippers – wandering around the base camp might be a demanding and risky task if there are any water surfaces around which got frozen, or there was already ice you couldn’t have spotted. The technology used for proper insulation of your feet is similar to that used in winter jackets: it is 500-600 fill or even more dense down of geese and ducks in the shell made of several layers of artificial fabrics blended to make the footwear both water resistant and breathable. Slippers can come in two forms: with heel counter and without, in the form of a clog. Slippers without heel are the most common form in slippers generally, but for a warm feeling in winter this design is not recommended, though some people still prefer such models for being lightweight and very breathable. 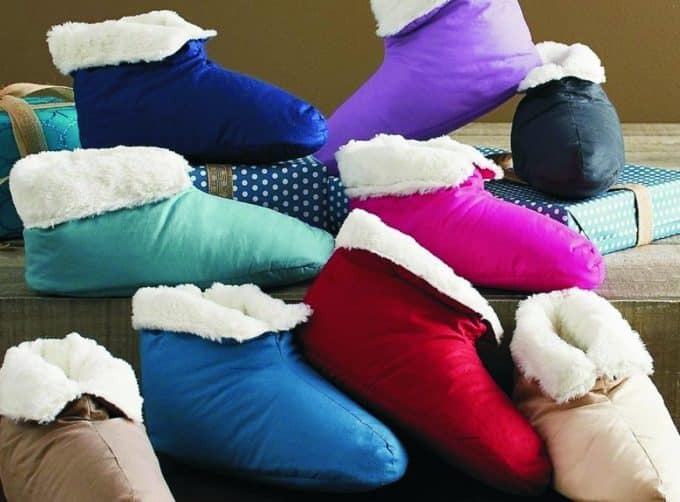 Those who prefer warmth may choose among a wide variety of down slippers, men’s and women’s, without heels, which are usually unisex. Slippers with heel counters and lining have a much better grip, making them good for various indoor and outdoor activities. These are also good at home and are good when you have to frequent areas that aren’t heated or go to the yard. There are clogged with a shallow heel counter, too. All those deep slippers, where lining goes above the ankle are called booties. These are not intended to replace actual boots, though modern materials make them equally good regarding insulation, very resistant and durable. 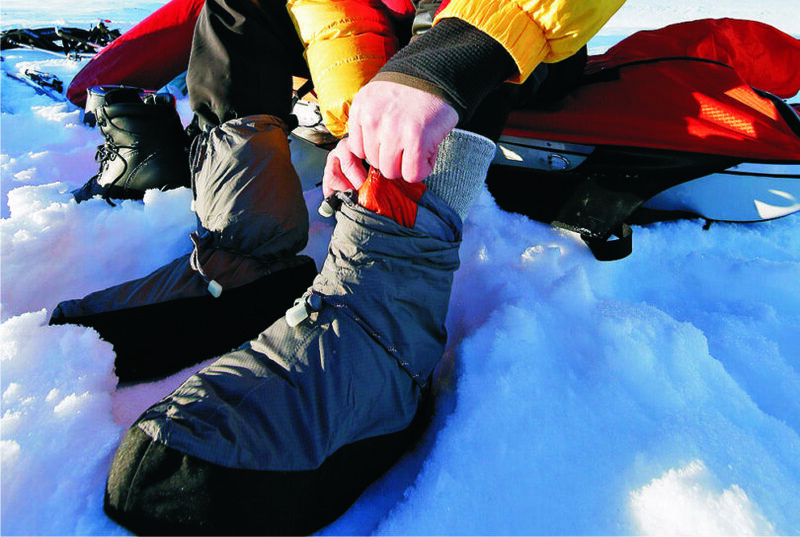 Booties are great for various outdoor activities and the most optimal type of footwear for winter camping. 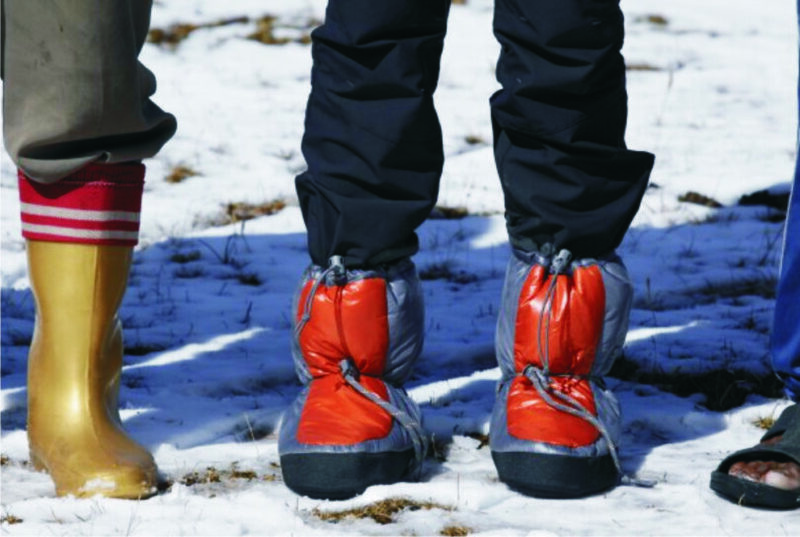 When in a base camp, a pair of quality insulation booties can be all you need from footwear. You can have them on inside and outside a tent or sleep with them on. For good hygienic manners, you should have two or three pairs of booties with yourself when camping lasting longer than two days. Most slippers, even those made with high density down are meant to use indoors. However, their insulating properties, sturdiness and quality of materials used makes them very good for outdoor use too. The best about the usage of booties and slippers in the outdoor areas is the fact these take the shape of your feet and feel really light. 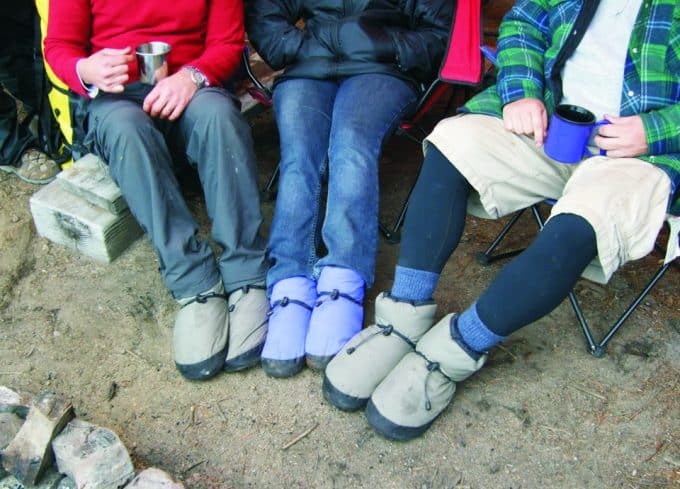 Nowadays, manufacturers often consult with active people such as campers and outdoor use is considered in the design and development of the most down slippers. If the winter of your campsite is harsh and very cold, every means of thermal and water insulation is good to have with yourself. Feet might be the hardest part of the body to keep warm, and you need to take great care to their insulation. However, warm feet require even blood circulation throughout your whole body, which means all parts of your body would be properly insulated. Without a proper insulation, you will have to keep your feet and especially toes busy in order to draw more blood there. With a good insulation of your whole body, it would be much easier to stay moderately active and warm. We realize that not all men are going to like wearing booties, and that is why they should be as comfortable as possible. Not only should you look for the right materials, but you should try them on around the house so they can get used to them and see if you find them comfortable. Also, you should know that when it comes to booties, they shouldn’t have a tight fit like boots or shoes, as they need to allow your feet to rest from that secured grip of the hard and heavy hiking boots. So, if you have some extra space in your slippers, great! Your feet will simply love them after a long day in boots. We also realize that not all men wear the same size in booties. Obviously, bigger feet need a bigger set of booties, so you will want to check out the sizing and see which ones will fit you the best. Sizing is important as your feet can feel cramped and therefore become sore over time. Prolonged camping involves sleeping and resting, this is why you should never do it without good insulation slippers. And below are some of the best and warmest insulation slippers and booties on the market. Now, you will be able to read through some reviews on the best booties on the market currently. We hope that you will find one from this selection! Be sure to look out for the finer details which can help you make an informed decision. Best use: Outdoor activities at heavy snow. Specific features: Shaft measures approximately 5.5″ from the arch, quilted slipper featuring a drawstring closure and embroidered logo at vamp. 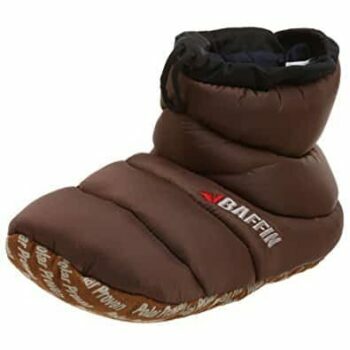 Description: The Baffin Slipper Booty is the modern sport booty designed specially for campers and other prolonged outdoor winter activities. 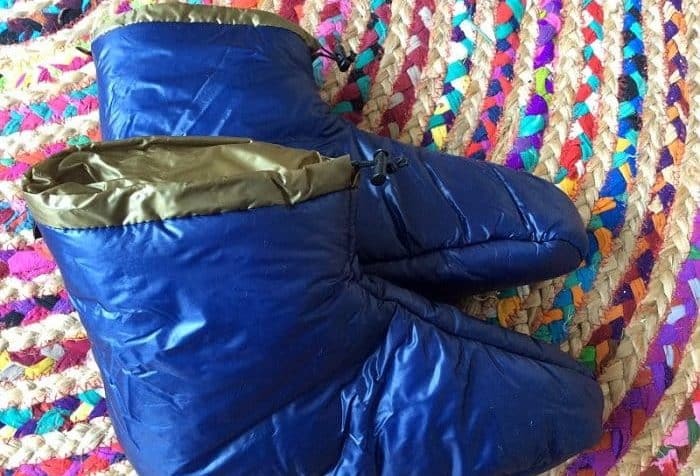 The manufacturer claims it’s a tiny sleeping bag for your feet. Among eight available colors you can find those appealing to ladies and gentlemen. Shoppers praise its roomy toe area, which combined with its moderately thick synthetic sole make it a perfect shape, for extreme movements in a campsite or back country. The outsole features a special leading edge surface knitting, which is flexible, but prevents slipping better than most thick rubber out soles found in the other. This comfortable booty comes in 8 colors like Hyper Berry, Dusk, Merlot, and the standard black. If you try them, you will see that their fit, is not only comfortable, but the high shaft of 5.5 inches from the arch also is a great design feature, plus the price isn’t bad either. Related: You should be prepared for your outdoor adventures, since there’s a long day to pass by the time to sleep in the camp site comes. A lot of things can happen and you need to be ready for anything. Therefore, we recommend that you check out the A2S Paracord Bracelets that has a compass built in as well as a fire starter, knife and whistle, all useful for outdoor excursions as well as for making a campfire. You can find this in a 2 pack for under $10. Best use: Various indoor and some basic outdoor activities. Description: Despite meant primarily for home use, the Fakeface Quilted Slippers feels so warm that you can bring them with yourself even to a camp. We recommend such slippers as spare for some more active booties. Natural insulation comprising of down and fleece will do the job in most moderate winter conditions. Another big reason for having these as your camping companion is the durable construction. There are ten color options, ranging from two vivid shades of rose to brown and black. Speaking of design, what we like the most is its narrow but flexible collar line which keeps the feet away from any snow or rain that would fall through. With 10 colors to choose from, you will surely find your favorite within the choices. All in all, the material is comfortable, the price is extremely affordable and they are wear resistant. Definitely worth your consideration. Related: When in the outdoors, you have to make sure that you wear some light pants that are good for hiking. The CQR Tactical Pants are under $40 and come in a variety of colors, and they are so light and comfortable that you can even wear them with the slippers as your in-tent sleeping combination. Description: For those who want an additional pair of featherweight home slippers inside a tent, the RockDove Quilted Slippers might be ideal. Despite being just clogged, these are warm enough to keep your feet comfortable and dry during some shorter activities. So, if you prefer to wear boots or booties, but sometimes want to wear them off over a short period, needing more air for your feet, you go with these artificial down insulated clogs. Despite rated as men’s by the manufacturers, their cushy look and feel makes them good for girls, too. Without many color options, though, but out there in the wild, it’s not much important, anyway. And you will not worry what to wear on your feet when you’re back home. As a bonus, there is memory foam so you will feel like floating or walking on the water while remaining perfectly dry (indoor only). With such an affordable price, these slippers are a great choice. Related: Hiking socks will keep your feet dry and comfortable. Try the Yuedge Socks as they are under $20 for the 3 pack and they are high performance and offer cushioning. Materials: Nylon upper surface, down insulation, synthetic sole, covered. 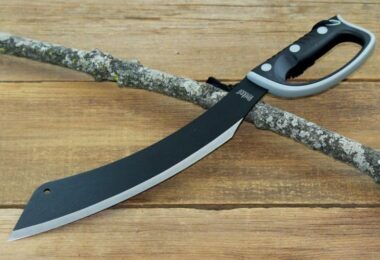 Best use: Indoor and basic outdoor tasks. 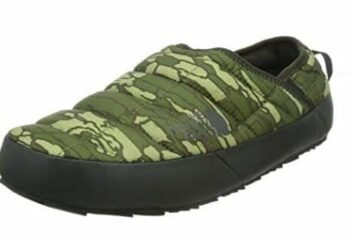 Specific features: Channel-quilted slipper featuring logo embroidery at entry and slip-resistant outsole, Polar proven fluffy insole, drawstring collar closure for a tight grip of your legs around ankles and keep the feet enclosed. 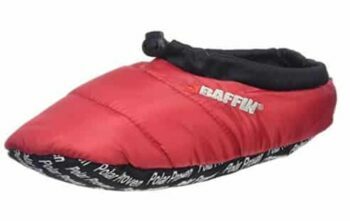 Description: If you’re looking for a premium pair of slippers for home and tent, you definitely go with the Baffin Cush Insulated Slippers. Materials used are of the highest quality, and the insulation is made of real poultry down. The squish filling at the insole will give you a feeling that you walk on the clouds – which is at least what the manufacturer claims. But note that Baffin’s main product is rugged boots and other active winter footwear. The slipper resistant outsole, makes these great for home and tent uses, as well as some short trips to the yard or around the campsite. You can choose among six colors, some of which are gender-specific. These slippers are good for those looking for universal, all-round footwear solutions. All in all, you will like the quilted feature as well as the comfortable material. They are not too expensive and they somewhat cinch around the top of your foot to prevent debris or wetness, which is nice. Related: For added stability and traction while on the track, and to be on the safe side since the slippers don’t offer as much traction around the campsite as boots do, a pair of trekking poles might come in handy. The Premium Ultralight Trekking Poles are collapsible and made of strong Tungsten material. They have flip locks and are great for hiking or walking. Materials: Polyester upper, cotton inner, synthetic insulation. Specific features: Machine washable, indoor skid resistant soles, elastic closure, stay on & easy on/off, elastic soles. Description: If you want just some basic slippers for a short rest from boots and other outdoor footwear, you will like the simplicity of the Forfoot Slip-On Mules Slippers. 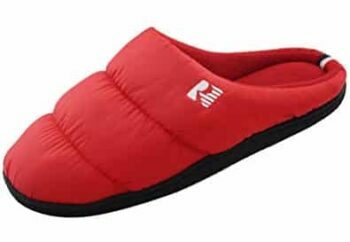 If the main purpose a pair of slippers is to be warm, but not rugged you need nothing more. However, there’s that elastic closure which would keep your feet dry if you need to get outside for a short time. The no-slip elastic outsole is ideal for use on multiple surfaces, including ice and slippery tiles. These slippers come in two color options. The great thing bout these slippers is that they can be machine washed, as you just have to follow the instructions, which are easy. They come in 2 nice colors; Gray and Vivid Turquoise, which definitely makes them stand out. You will be happy to find out that these slippers will not ski, they keep their shape, and they will not scuff your flooring. A nice touch is that the slippers are wear resistant. Related: Staying hydrated is as important as having dry and warm feet. Therefore, we recommend that you check out the Talonite Water Bottle that comes in 3 sizes and 3 color choices. You can take it anywhere from the gym to the camp to a trail! Materials: ThermoBall and PrimaLoft insulation upper, rubber sole. Specific features: Durable, water-resistant, 100% recycled P.E.T. Ripstop upper, 40% recycled rubber outsole for supreme traction. Description: If you’re looking for functional luxury in a pair of slippers, The North Face Thermoball Traction Mule 2 is an ideal solution. Advanced materials brought by a renowned active wear manufacturer will keep your feet in incredible warmth and dry condition, breathable and without sweating. This is another release developed primarily for camping and other back country activities during harsh winters. Sometimes it’s better to have a thick rubber sole. With high insulation quotient you will not really need it to feel like socks which you wear anyway. Thanks to the materials used for the upper and the insole the rubber doesn’t make it heavier than an average insulation slipper. The insole is about a half inch thick and is topped with a layer of memory foam. Overall, we must say that this is a high quality pair of slippers. While a little pricey, we love the style, strength and insulation that the slippers provide when wearing them. Related: Stay hydrated with the CamelBak Chute 1L Water Bottle as it costs under $15 and holds a full liter to keep you from refilling too much. It is durable and comes with a closing lid so you don’t spill any liquids during your outdoor adventures. We have reached the end of our article. 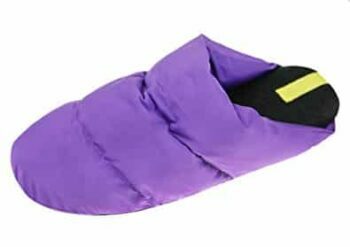 By now, you have learned that the slippers have evolved from yet another necessity for camping to active outwear which can improve your camping experience, keeping your feet dry and warm. 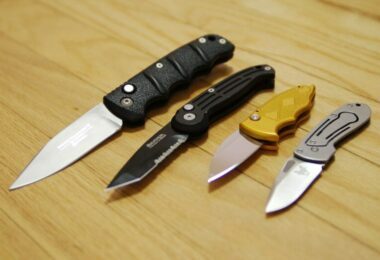 Some of the models shown above can serve multiple duties, so one pair can be good at home and outdoor. Our opinion is that you should best be buying a pair of booties for heavy outdoor duties and a pair of light slippers, which can even be clogged for some quick excursions from the tent. Most slippers of today are really light, so having two pairs with yourself won’t add much to the backpack’s weight. This approach can also help keep your tent’s interior clean. 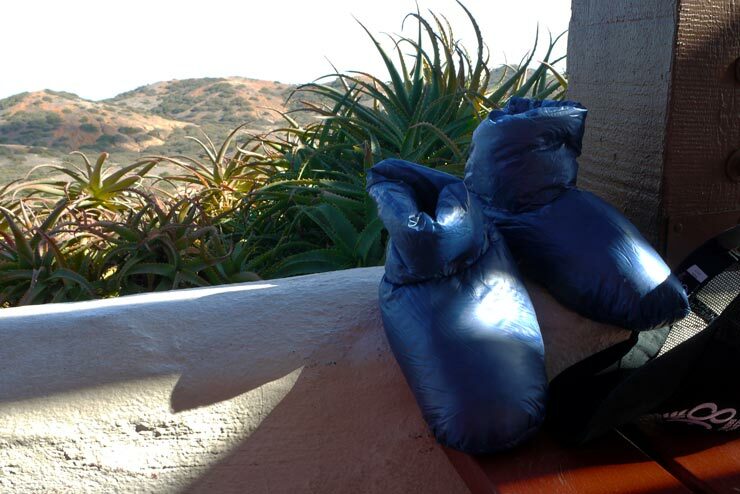 Booties can be used only for the outdoors, while the slippers should be for indoor only and never wet or muddy. 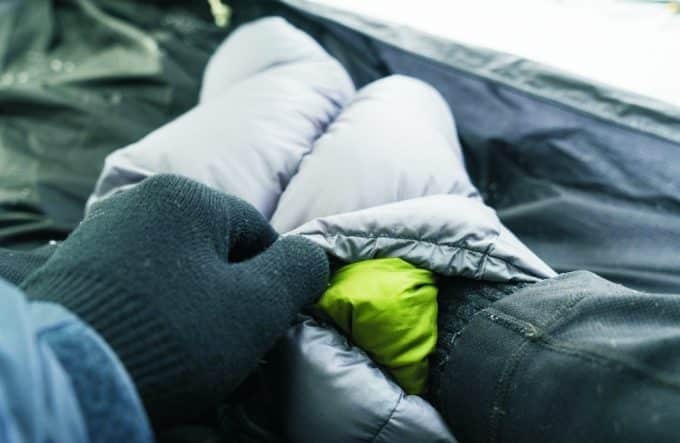 How warm you will really feel depends on many factors: the level of activity, quality of socks worn, the amount of other insulation and even tent insulation, foot circulation and others. Some models may be overly insulating and it would lead to sweating and other discomfort. Explore the market further if you are unsure about what fits you the best, and order only when you are sure a model is not too warm or too cold for you. Feel free to share any experiences with the aforementioned slippers, and if you find some other models better for you, share that with us and tell what are the advantages of your choice.